The women find a weapon to defeat Rodney. Rita tells Alice she has big plans that nothing can interfere with. The brief shot of Rita's scan in the "Somaton" at "Heidelberg Repat. Hospital" clearly shows her name and the date 19-AUG-86, which was probably the date the scene was shot. Rita makes Kath reconsider by sarcastically urging her to get on with it, as she now has an audience or someone to call for help in time. When Kath attacks her, Rita takes the scissors from her and agrees to help her if she needs it. To Kath's puzzled enquiry why she replies "You're dead a long time, Maxwell. Why rush it, eh?" Tom tricks Merle into reading by writing on the blackboard instead of talking to her. Kath realises there is something wrong when Rita argues her case when Kath is sent to the laundry to work. While on skip duty Kath seeks out Rita to find out what's going on. 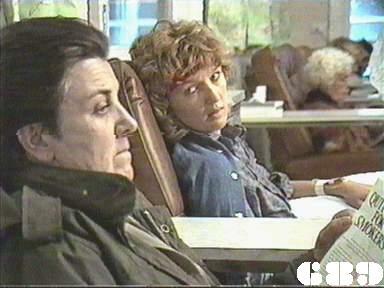 Rita tells Kath she is suffering from anaemia: Kath looks as if she doesn't quite believe it. The women stick together as Rita advised and make Rodney back off from harassing Lisa. Spike advises them not to get too cocky with this limited success as this would not work on Joan. Tom sees Merle pointedly ignoring Kath as she passes with the laundry skip and tries to get her to talk about it. Joyce catches Harry comforting Alice which she mistakes for "canoodling". Lisa is told by Joan that Kath is moving in with her, and objects leading the women in a chorus of "Get stuffed, Freak". Joan goes to Ann to demand punishment for the women, but is reminded that she was not accompanied by another officer who could corroborate her story. Ann is "invited" to talk to the Minister after she sends her report directly to the Premier's Office: she tells him she will not let him suppress her reform report. Joan loses her only (potential) support when Rodney realises that the women are out to get her. Rita asks to be accompanied for her next treatment by Joan, as at least she won't have to put up with well meaning pity. Tom tells Kath he wants her as a teacher's aide, but only for Merle's sake. Rodney finds Rita throwing up in the shower block (to the accompaniment of some wildly inappropriate spaghetti Western Spanish guitar). Lisa and Kath don't get on very well when they eventually do have to share a cell. Ann allows Tom to give Rita the books on cancer (one of them is "On Death and Dying" by Elizabeth Kubler-Ross). Rodney torments Merle and threatens to have her sent back to the "loony bin": Kath threatens to take two bottles of contraband with his fingerprints on to Ann if he tries it again. Joan feels as if she's been sent to Coventry when no-one talks to her as she leaves work. Rita's treatment continues , and while they are the hospital, Rita tells Joan about the opportunities she regrets missing, like a job she could have done worth $250,000.